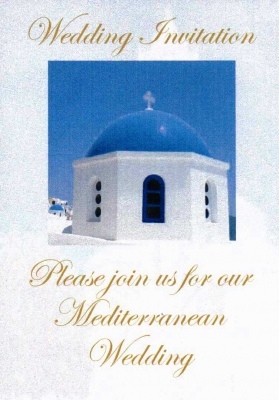 A mediterranean wedding invitation featuring a blue and white chapel, comes complete with a matching insert printed with your wedding details and white envelope. The wording on the front of this invitation can be altered to your choice or completley removed. This wedding invitation is also available as an evening invitation which also makes it suitable to use for a mediterranean themed wedding, engagement invitation or a anniversary invitation. A sample is available on request.